Buddhist expansion in Asia, Mahayana Buddhism first entered China through Silk Road. Buddhism entered Han China via the Silk Road, beginning in the 1st or 2nd century CE. 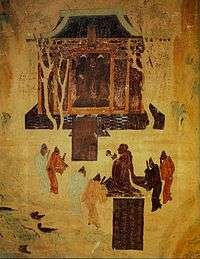 The first documented translation efforts by Buddhist monks in China (all foreigners) were in the 2nd century CE, possibly as a consequence of the expansion of the Buddhist Kushan Empire into the Chinese territory of the Tarim Basin. Direct contact between Central Asian and Chinese Buddhism continued throughout the 3rd to 7th century, well into Tang period. From the 4th century onward, with Faxian's pilgrimage to India (395–414), and later Xuanzang (629–644), Chinese pilgrims started to travel by themselves to northern India, their source of Buddhism, in order to get improved access to original scriptures. 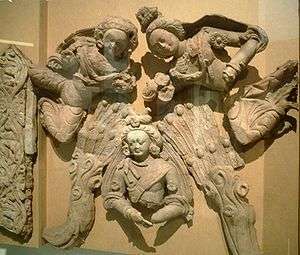 Much of the land route connecting northern India with China at that time was ruled by the Buddhist Kushan Empire, and later the Hephthalite Empire, see Gandhara. China was later reached by the Indian form of tantra "esoteric Buddhism" (Vajrayana) in the 7th century. Tibetan Buddhism was likewise established as a branch of Vajrayana, in the 8th century. But from about this time, the Silk Road transmission of Buddhism began to decline with the Muslim conquest of Transoxiana, resulting in the Uyghur Khaganate by the 740s. The first documented translation of Buddhist scriptures into Chinese occurs in 148 CE with the arrival of the Parthian prince-turned-monk, An Shigao (Ch. 安世高). He worked to establish Buddhist temples in Loyang and organized the translation of Buddhist scriptures into Chinese, testifying to the beginning of a wave of Central Asian Buddhist proselytism that was to last several centuries. An Shigao translated Buddhist texts on basic doctrines, meditation and abhidharma. An Xuan (Ch. 安玄), a Parthian layman who worked alongside An Shigao, also translated an early Mahāyāna Buddhist text on the bodhisattva path. During the fifth and sixth centuries C.E., Merchants played a large role in the spread of religion, in particular Buddhism. Merchants found the moral and ethical teachings of Buddhism to be an appealing alternative to previous religions. As a result, Merchants supported Buddhist Monasteries along the Silk Roads and in return the Buddhists gave the Merchants somewhere to stay as they traveled from city to city. As a result, Merchants spread Buddhism to foreign encounters as they traveled. Merchants also helped to establish diaspora within the communities they encountered and overtime their cultures became based on Buddhism. Because of this, these communities became centers of literacy and culture with well organized marketplaces, lodging, and storage. The Silk Road transmission of Buddhism essentially ended around the 7th century with the rise of Islam in Central Asia. From the 9th century onward, therefore, the various schools of Buddhism which survived began to evolve independently of one another. The vigorous Chinese culture progressively absorbed Buddhist teachings until a strongly Chinese particularism developed. 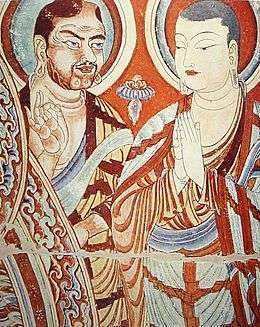 In the eastern Tarim Basin, Central Asian Buddhism survived into the later medieval period as the religion of the Uyghur Kara-Khoja Kingdom (see also Bezeklik Thousand Buddha Caves), and Buddhism became one of the religions in the Mongol Empire and the Chagatai Khanate, and via the Oirats eventually the religion of the Kalmyks, who settled at the Caspian in the 17th century. Otherwise, Central Asian Buddhism survived mostly in Tibet and in Mongolia. ↑ "These two Sanskrit terms, given in the Chinese text in phonetic transcription, refer to lay adepts and to Buddhist monks, respectively"; and show detailed knowledge of Buddhist terminology. 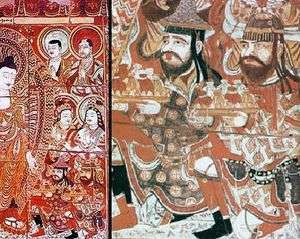 ↑ The (8th century) fresco discovered in the Mogao caves (near Dunhuang in the Tarim Basin) that depicts Emperor Wu worshipping two Buddhist statues, "identified as 'golden men' obtained in 120 BCE by a great Han general during his campaigns against the nomads". 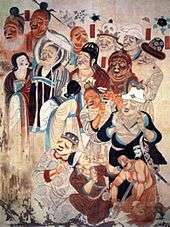 Although Emperor Wu did establish the Dunhuang commandery, "he never worshipped the Buddha." ↑ Zürcher (1972), pp. 22–27. ↑ Hill (2009), p. 30, for the Chinese text from the Hou Hanshu, and p. 31 for a translation of it. ↑ Zürcher (1972), p. 23. ↑ Oscar R. Gómez (2015). Antonio de Montserrat - Biography of the first Jesuit initiated in Tibetan Tantric Buddhism. Editorial MenteClara. p. 32. ISBN 978-987-24510-4-2. ↑ Loewe (1986), pp. 669–670. ↑ Jerry H. Bentley, Old World Encounters: Cross-Cultural Contacts and Exchanges in Pre-Modern Times (New York: Oxford University Press, 1993), 43-44. ↑ Jerry H. Bentley, Old World Encounters: Cross-Cultural Contacts and Exchanges in Pre-Modern Times (New York: Oxford University Press, 1993), 48. ↑ Zürcher (1972), p. 26. ↑ Zürcher (1972), p. 27. Compare Maspero (1981), p. 405. ↑ Tr. by Zürcher (1972), p. 27. ↑ Demiéville (1986), p. 821. ↑ Zürcher (1972), p. 28. ↑ Rong Xinjiang, 2004, Land Route or Sea Route? Commentary on the Study of the Paths of Transmission and Areas in which Buddhism Was Disseminated during the Han Period, tr. by Xiuqin Zhou, Sino-Platonic Papers 144, pp. 26–27. ↑ Tr. by Hill (2009), pp. 56–57. ↑ Zürcher (1990), p. 159. ↑ Hill (2009), p. 31. Compare the account in Yang Xuanzhi's (6th-century) Luoyang qielan ji 洛陽伽藍記, tr. by Ulrich Theobald. ↑ Zürcher (2007), p. 20. ↑ Saunders (1923), p. 158. ↑ Williams (2005), p. 57. ↑ Tr. by Zürcher (2007), p. 24. ↑ Draft translation of the Weilüe by John E. Hill (2004) The Peoples of the West. ↑ Zürcher (2007), p. 25. ↑ Demieville (1986), p. 824. ↑ Zürcher (2007), p. 22. ↑ Zürcher (2007), p. 14. ↑ Tr. by Henri Maspero, 1981, Taoism and Chinese Religion, tr. by Frank A. Kierman Jr., University of Massachusetts Press, p. 402. ↑ Tr. Dubs (1937), 4-5. ↑ Zürcher (2007), p. 21. ↑ Whitfield et al (2000), p. 19.